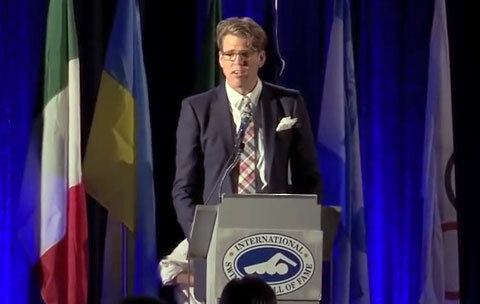 COLORADO SPRINGS, CO. — Five-time gold medalist swimmer Gary Hall Jr. will be the keynote speaker at the the 11th annual Breakfast of Champions, which benefits the Peak Vista Community Health Foundation. The event will be held from 7:30-9 a.m. on Nov. 12 at The Broadmoor in Colorado Springs. Source: KKTV.com. The Breakfast of Champions is a unique chance for the public to hear Olympians share their stories–and all for a good cause. Hall certainly has a story to tell: overcoming a Type 1 diabetes diagnosis in 2000, he competed in three Olympics between 1996-2004; in addition to five gold medals, the decorated swimmer has received three silver medals and two bronze. “We’re so blessed here in Colorado Springs to have this amateur athletic focus…personally, I attend so many fundraising events–this is my favorite,” Bruce Panter, a gold medal sponsor of the event, told 11 News’ Dave Nancarrow. Peak Vista Community Health Centers provides medical, dental and behavioral health services for over 80,000 patients ranging in age from infants to the elderly. Proceeds raised at the Breakfast of Champions help the organization continue this work. Gary Hall Jr. represented the United States at the 1996, 2000, and 2004 Olympics and won ten Olympic medals (five gold, three silver, two bronze). He is a former world record-holder in two relay events. Hall is well known for his “pro-wrestling like” antics before a competition; frequently strutting onto the pool deck in boxing shorts and robe, shadow boxing and flexing. In 1999, Gary was diagnosed with type 1 diabetes. Doctors told Gary that he would never again be able to train and perform at the elite level that saw him win four medals, including two gold, at the 1996 Olympics. There was no precedence of elite swimmers successfully training and competing with diabetes. Gary has given every person living with diabetes proof that they can enjoy a healthy and balanced lifestyle. Gary travels the world talking to parents, coaches, athletes and executives about his experience with diabetes. He is the recipient of the first and only USA Swimming Humanitarian Award for his work on behalf of diabetes awareness. Gary is a member of the Board of Directors of the International Swimming Hall of Fame, and the Diabetes Research Institute, as well as being a spokesperson for the Juvenile Diabetes Research Foundation. PFP Sports & Celebrity Talent Agency is a booking agent for motivational sports speakers and celebrities. If you would like to book professional athletes or Olympic stars like Gary Hall Jr. for a speaking engagement, personal appearance or special event, you can request Gary Hall Jr. agent and speaker information from PFP Sports & Celebrity Talent or call 800.966.1380.